There are lots of Measuring Cups on the market. Most are very inexpensive. I have had my set of measuring cups for years. I cannot even remember when I purchased them but think it must have been just after I got married in 1989. They are invaluable. Cheap to purchase yet priceless to me. The stainless steel set is nicely weighted so that the cups don't tip over on the bench. They stack neatly into each other so the cups are easily stored. Also, they are great for cracking eggs into! There are some great sets available that include both measuring cups and measuring spoons. I love this 19 piece set which is in both standard and metric measurements. 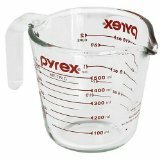 I have had a couple of pyrex measuring jugs during that time. I love these glass measuring jugs as they can go in the microwave and dishwasher. Great for melting butter in the microwave. The jug holds two cups and has both metric and imperial measurements so it is easy to follow any recipe.